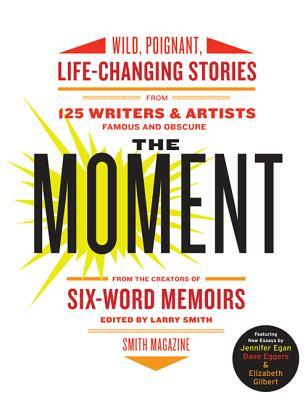 From the creators of Six-Word Memoirs comes The Moment, a collection of personal stories from writers both famous and obscure revealing how a single instant changed their lives forever. An innocuous decision, an unforeseen accident, a chance conversation, a tag sale, a terrorist strike, a tweet . . . sometimes all it takes is a single moment to redirect the course of an entire life. In the tradition of Smith magazine’s Not Quite What I Was Planning and the sensational Six-Word Memoirs on Love & Heartbreak—and in the spirit of StoryCorps, the Moth, and This American Life—The Moment unveils everyday people’s inner lives in narratives of all shapes and sizes, with stories from six to 1,000 words, photographs, comics, illustrations, handwritten letters, and more. It’s enough to change your life forever. LARRY SMITH is an adjunct associate professor of economics at the University of Waterloo and a recipient of the University of Waterloo’s Distinguished Teacher Award. During his longstanding tenure, Smith has taught and counselled more than 23,000 students on the subject of their careers, representing more than 10 percent of UW’s alumni. Smith has worked with more than 500 teams of student entrepreneurs, advising them as they have created companies of significant size and success across industries as broad-reaching as communications, software, robotics, entertainment, design and real estate. Smith is also president of Essential Economics Corporation, an economic consulting practice that serves a wide range of public and private clients. “Why You Will Fail to have a Great Career,” his TEDx Talk based on his experience counselling students, has been viewed by over six million people.